It certainly inspires one with a sense of deep admiration to imagine the coming of the early settlers to the Walhonding Valley. They were certainly a hardy courageous persevering people. We cannot conceive what privations, sacrifices, and distress were suffered by this slowly wending file of pioneers, migrating over Indian trails to the trackless forests of Coshocton county, abounding here and there with Indians and wild animals. As we read extracts of their lives, let us reverence the memory of these patriarchal trail blazers who have done so much to smooth out the rocky places in the pathway of succeeding generations and have made �human labor lighter and the human countenance far brighter� by their having lived. An extended list of the earliest settlers including the secondary early followers might be mentioned, but as our space is limited and genealogies are long, we much content ourselves with brief accounts of the earliest and perhaps by mentioning only the names of the secondary settlers. Perhaps the pioneer settler of Jefferson Township was Joseph Butler who came from Virginia in 1803. He settled on the Washington Darling farm now called the �Evergreen Farm� and built a log cabin in the present house yard of that farm. He died in 1809 and was buried on the hill back of the house. A great-great-grandson recently tore down the slab at the head of the grave and erected a granite monument. His son Isaac met death in crossing a ford near the cabin and his death is regarded as the first one in the township. The Indians called at the early Butler cabin occasionally and were invited to eat with them. They always accepted the invitation and usually devoured all they could and took the rest with them. One time Mrs. Butler visited the Indians as they were preparing a meal. They placed an uncleaned deer, head, hair and all, in a large kettle to boil and later they cooked turnips in the broth. Mrs. Butler did not stay for the Indian feast. Many deer inhabited the forests in those days and the lower limbs of a tree near the Butler cabin was filled with hanging deer horns from these animals killed by the early Butlers. Several other Butlers were early county settlers, but they do not concern our sketch of Jefferson Township settlers. 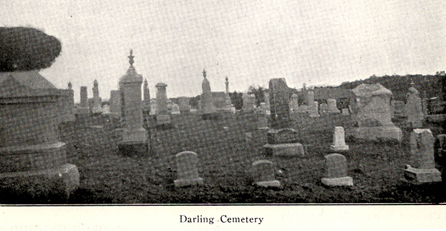 The direct living descendants of this early ancestor are: The Washington Darling family, Everett Darling family, Mrs. Moore, and Mrs. Herman Johnson. The Darlings were among the foremost settlers to locate in the region of this sketch. This early family consisted of Robert Darling, his wife, and twelve children, namely: William, Abram, Jonathan, Jacob, James, Isaac, Thomas, Robert, Mary, Sophia, Jestena, and Rebecca. They emigrated from Virginia in 1806 and settled in the Bell Section of Jefferson Township north of the Walhonding river. Robert Darling built a log cabin fashioned together with wooden pins, located near the present Darling cemetery. It is said that Mary, a girl eighteen years old, drove a four horse team loaded with the family goods over the Allegheny Mountains and the wife rode horseback with a baby on her lap and little Thomas, about seven years old, riding behind. Both of them traveled this way a distance of about five hundred miles. They had very good crops from the virgin soil of those days and by means of the hominy mortar which was a hole chopped or burned in the end of a log, into which corn was placed and mashed with a pestle, they eked out a meager existence. A few years later, Robert Darling built a grist mill near his home and he and other early settlers ground their grists at this mill. By perseverance and hard work the Darlings came into possession of about two thousand acres of early soil and their people have been and are at present thrifty, industrious farmers and business men of Jefferson Township and Warsaw. Their descendants are too numerous to mention in this brief sketch. This family is the only one whom we have treated in this article whose ancestry goes back to Wales. The original ancestors of the Meredith family, Job and wife, Lydia, were born and lived in Wales. The early family came to Maryland and Stephen came first to Coshocton county. One day soon after Stephen�s departure, Abner, at the age of fourteen, left the old homestead in Maryland, his parents not knowing where he had gone, never to return again. Years later, he married in Pennsylvania and with three children came to Jefferson Township in the year 1807 at the age of twenty-eight. They settled in a log cabin located on the present farm of Everett Darling and the father lived to the old age of ninety-one years. Abner was a hunter of note and on very friendly terms with the Indians. He hunted for deer with the Indians in the early wooded district of the township and along Killbuck Creek. Once when they were celebrating over a very successful day�s hunt and engaging in some athletic feats, Abner outdid the Indians in some of the contests. This greatly humiliated and angered the Indians and this feeling was somewhat intensified rather than assuaged by a few potations of �fire water.� The squaws anticipated the danger which Mr. Meredith was now in secretly stole the knives of the Indians and suggested measures for his safety. Mr. Meredith quietly slipped away and withdrew to his cabin as previously mentioned. The only direct living descendant of the Merediths in Jefferson Township is Sarah Meredith. The Brillharts� family history would make a volume of two hundred and fifty pages. The original members of the family came from Germany to Pennsylvania. Some later drifted into Virginia and from there to Coshocton county, Ohio. One, Samuel, came to this county about the time the Darlings came. He had learned the coopers� trade with his father and brothers, and in addition to that trade they made their guns, wagons, and farm implements, doing all their own blacksmithing. He entered a claim of eighty acres not knowing how he would pay for it as he had only twenty-five cents in money and a team of horses. Soon, with the aid of his sons and daughters, he made enough barrels at thirty-seven and one-half cents apiece to pay for his land. In time he became wealthy, owning one thousand acres of land. His large family of children by two marriages became early settlers and furnished wives for other early settlers of Jefferson and Monroe Townships. One of whom was Catherine, who became the wife of Matthias Stover, an early settler who came from Virginia. Another was Elizabeth who became the wife of John Frederick, an early settler. We cannot name all the Fredericks, Bowers, Infields, McNeals, Gamertsfelders, Stovers, Crouls, Shepards, Brillharts, Myers, Kasers, Willises, Hays, and others, many of whom populate the northeastern part of Jefferson Township and Warsaw, and furnish both with an appreciable part of their good citizenry, who trace their ancestry back to this early family. Thomas Tredway, born in Hartford County, Maryland, came to this county in his eighteenth year with his father. Thomas purchased 160 acres from Col. Simmons at $3.50 per acre and other tracts from others at $12.00 and $8.00 per acre respectively. He acquired in all about eight hundred acres. He built a good brick house n his land that was occupied in turn by his son Joseph, who was the father of Edward Tredway, who now resides at the old Thomas Tredway home. Thomas was a fine horseman and would ride a horse if he could get astride him anywhere between his ears and tail, going at breakneck speed. He was also a great hunter and one time while religious services were going on at his father�s house, located in Bedford Township, he returned from a hunt. His little brother, Corbin, seeing him draw near during the midst of the services cried, �Here comes Tom, but no game.� This greatly mortified Tom and his parents. When a young man, he and two other young men drove a lot of stock from Ohio to Baltimore, Maryland. After completing this task, he visited his former relatives and friends. His cousin accompanied the three back a distance, when the feature of their parting was a four-handed reel in the country road, on the completion of which they parted never to meet on earth again. He had a large family of children. Some of his present living descendants of this township are: Mina Clark and family, Clara Sharpless and family, Edward Tredway and family. It will no doubt be interesting to learn something of the life of this distinguished Revolutionary soldier, the account of whom we are indebted to Mrs. Lucia Walsh, of Des Moines, Iowa, the only person living, a great-granddaughter, who could give us any information, and to whom we express our sincere appreciation. The parents of Col. Simmons were English and came to America in the year 1750. His mother, Josephine La Pointe, was born San Domingo, a province in Haiti. Col. Simmons, of whom we are writing, was born at Newburg, New York, in 1757, and died near Coshocton, Ohio, in 1825. Three children were born to them while living at Washington, D. C., namely: Charles William, Josephine, and William Henry. Col. Simmons entered the Continental army at the age of eighteen, rose to the rank of colonel and commanded a brigade at the battle of Trenton, New Jersey. He was a trusted friend of Washington, Greene, and other generals. He, with George Washington, surveyed a large part of Washington, D. C., while the capital was at Philadelphia. Further services received from Washington was his appointment as accountant in 1795 to the Department of War. He was reappointed a second time by Washington, and a third time by Adams. Having served his country in a military and official capacity for nearly forty years, President Madison offered him any office within his gift, but he desired to retire. He was given 4297 acres of land as part payment for his services to his country. This was beautiful rolling land about ten miles from the city of Coshocton, the present southeastern quarter of Jefferson Township. Here he moved about 1820, bringing with him the first family carriage, his colored servants, and enough solid silver service to set a table for twenty people. He died a few years after coming and was buried on his estate. A marble slab with pedestals covered his grave which has disappeared. 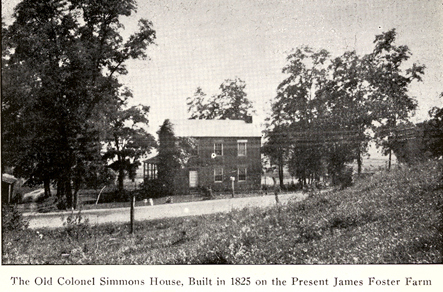 The house built by Colonel Simmons was burned and the present standing brick structure owned by the James Foster heirs was built by his son, William Henry, in 1831. Only his great-grandchildren are now living. General William Carhart, a soldier of the War of 1812, under General Lewis Case, was born in Hamilton county, Ohio, March 17, 1795, died at Farmington, Iowa, March 18, 1884. After the close of the War of 1812 he attended the Ohio State University at Athens, Ohio, then entered the study of law and was admitted to the bar. He practiced law for a number of years. When favorable opportunities arose he engaged in other business enterprises. He took an active part in politics, being a staunch Whig; also in the organization of the state militia, which constituted at that time interesting and exciting events in its history. William Carhart was a son of Seth Carhart (born 1760), who moved to Ohio from Carlisle, Pennsylvania, in 1785, and settled at the mouth of the little Miami river. Subsequently he moved to Dresden, Muskingum county, Ohio. Seth Carhart married Margaret Scott. Seth Carhart and his wife are buried near Dresden, Ohio. William Carhart�s first wife was Josephine Simmons, a daughter of Col. William Simmons. She was born 1801 in Washington City and came with her father to Warsaw in 1820, married William Carhart in 1823, died 1842. William Carhart�s second wife was Susan Chambers, daughter of Col. David Chambers of Zanesville, died 1887. Willima Carhart has four living grandchildren: Mrs. Jeanette Ferguson, Paola, Kansas; Mrs. Josephine Greer, William Carhart DeTar, Edgerton, Kansas, and Mrs. Mary E. Huston, Morgantown, West Virginia, to whom we are indebted for this account. His paternal grandfather was a captain in the British navy. His father, Pren Metham, was born in London, England. When a youth of nine, he ran away, crossed the Atlantic to America sojourning at Philadelphia where he learned the bakers trade. He moved in 1820 to Jefferson Township, purchased a large farm along the Walhonding on which Pren Metham was born April 30, 1830. After spending his early days on this farm and in the schools of Jefferson Township and West Bedford High School, he earned the title of Colonel by enlisting in the army and proceeding by graduating steps from Second Lieutenant to Major, and then to Colonel. The principal engagements in which he participated were: Corinth, Vicksburg, Chattanooga, Lookout Mountain, and Missionary Ridge. He marched with Sherman to Atlanta and was present at the surrender of Richmond. On his way home he visited Ford�s theater on the night of Lincoln�s murder and instinctively reached for his revolver to shoot Booth, forgetting that he had removed his side arms that evening. A recent report in The Tribune gave the statement that he received 4000 acres of land for his services. He married Sarah Proudfit, a descendant of an original John Proudfit, who was beheaded in England. 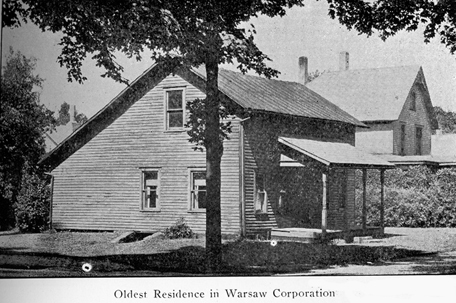 There were eight children, one of whom now owns a part of the original homestead above Warsaw. Mr. Metham lived his entire life, with the exception of the last five winters, which he spent with his daughter in Florida, on the farm in Jefferson Township. He was actively engaged in civic and political circles, having promoted the first railway and highway in the township and took an aggressive attitude toward better schools and social reforms. He possessed an aggressive mental alertness, genial good humor, and straightforward sincerity. The ancestors of the Moore�s, Given�s, Thompson�s, and McFarland�s families of Mohawk community owned a life lease on the estate of Lord Montjoy, a member of the British House of Lords, in Ireland. Lord Montjoy was interested in pure blood stock and required the estate to be kept in good order. After his death, his son became a profligate and since one daughter Isabel Moore had married a Methodist preacher, they all desired to go to America to found a colony and a Methodist church. Our history of the Moores goes back to two brothers, James and John. James and wife died in Ireland in 1800. Parker, a son, came to America in 1808 � lost to his people. Rebecca married John Given, ancestor of Walter Given, of Nellie; John Moore, ancestor of J. Q. Moore and Mrs. Taggart; James, ancestor of Dr. P. M. Moore, Ella Moore, and R. H. Moore; Sallie married Wm. McFarland; Isabel married Rev. John Thompson. John Moore, the other brother, and family collected their household goods, laid in a supply of provisions and in August, 1830, set sail from Londonderry for America, and after three months landed at Philadelphia. There they fitted out a six horse team and wagon and started across the Allegheny Mountains. After seventeen days� travel they came to the McFarlands who had come from Ireland some years earlier. A month later the James Moore family left Ireland and after a few days there was a violent storm which greatly damaged the ship. James, the grandfather of Floyd Moore, of Nellie, went aloft to untangle the rigging and spars and was given the credit for saving the ship and the lives of all on board. By 1832 all were settled in Washington county, Ohio. The former was a banner agricultural section and the latter was famous for excellence in wool and the wool growers of Coshocton county are no doubt yet reaping the benefits of those men�s experience in that part of the country. In 1838 these families bought 2210 acres of heavily timbered land in the Bell section of Jefferson Township. The land cost $5.75 an acre, and not one acre fit to cultivate. The families moved here in 1840 and that year the Methodist church was organized. The settlers mentioned were soon joined by the Finlays, Rowlands, McFaddens, Grahams, Campbells, McCulloughs, and a few years later by the Andersons, Turners, Kyles, and Downeys. So many of these were Irish that the community was known as �Young Ireland.� William McFarland built the first dwelling in Mohawk and was appointed the first postmaster in Mohawk Village. Several plants were established in this vicinity for making coal oil out of cannel coal, and George Horn built the first threshing machine and separator ever used in Coshocton county. This machine lacked the modern straw stacker and band cutter, but was owned and used successfully for years by the farmers of Mohawk. One of the early settlers of Jefferson Township was Robert Simpson, who was born in Elgin, Scotland. He came to this country about 1822 and settled at first in the vicinity of Warsaw. Later he settled on �Scotch Hill,� probably named because of his Scotch ancestry, near the present home of Roy Bower. He married Eliza Moffit, of Pennsylvania, and the following children were born: Isabelle, Anna, Mary, Ruth, and Flora. The descendants of this family living around Warsaw at present are: William and Anna Riley. He was an early township clerk and the old records left show him to have been a very precise business man and a good writer. He also was a mason and draughtsman on the early Walhonding canal. Henry Myers nearly a century ago came to Roscoe from Germany. He moved his household goods soon after on the newly made Walhonding canal and settled on the present farm of Wilbert Myers. He married Wilhelmina Nemond and eleven children were born: Wilhelmina, Sophia, Louisa, John, Elizabeth, Christina, Henry, Mary Magdalene, Barbary, Charles, and William Frederick. Descendants living in this community now are: Christina Clark, Carl Myers, John Myers, William F. Myers, Chas. Myers, Mrs. Stuart Sheperd, and their families, and Mary Myers. John Elder came from Ireland to Virginia in 1804, and in 1806 came with the Darlings to the Walhonding Valley. He settled in a log cabin in the Bell section of Jefferson Township, near the Butlers and Darlings. 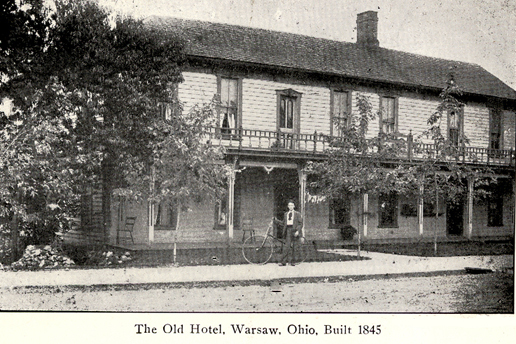 Later he moved to homestead one-half mile west of Warsaw, now owned by Anna Walker. He raised a large family of nineteen children by two marriages, two sons of whom concern directly this community at present. They were: William, father of Ollie, Cyrus, and William H., and John, father of Samuel and James. Scarcity of food caused this early pioneer to live one entire winter on one sack of corn meal and the wild game which he could get that inhabited the woods. 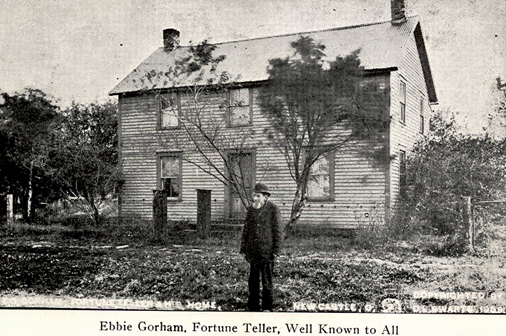 The families of Cyrus Elder, W. H. Elder, Samuel Elder, and the late Ollie Shaw remain to enliven the memory of this early pioneer. Joseph Speck was born in Germany in 1808, lived a somewhat varied life. At seventeen he began blacksmithing, which he pursued for three years, while subsequently he worked as a journeyman for one year. For six years he served in the German army and then sold clocks for two years. About 1833 he embarked for the United States, landing eight months later. He then came to Jefferson Township, worked on the Walhonding canal, entered land and erected a log cabin thereon with clapboard roof, puncheon floor, and a door with wooden hinges. In this primitive structure he lived to be eighty-eight years old. His living descendants in this community are: Mrs. R. C. Bantum and family, and Mrs. C. D. Laughlin and family. John Severns came to Jefferson Township, Coshocton County, from Pennsylvania in 1817. He settled in the northeaster corner of the township. A son Samuel was the father of John and Joseph now living near the old settlement. At the time Mr. Severns came here not a stick of timber was cut between Warsaw and Spring Mountain. Deer roamed the wooded country in great numbers and due to some mineral element in the water of a spring located on the Severn settlement they came in great numbers to drink. 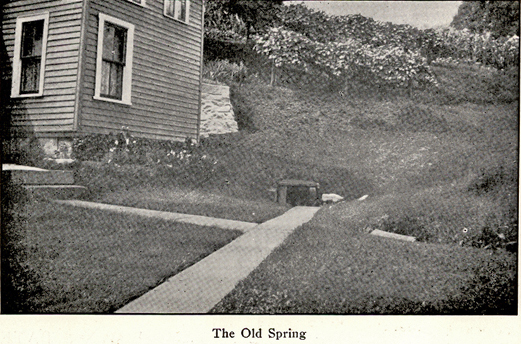 This spring was named Deer Lick Spring. Rattlesnakes are practically unknown in this country now, but one day when one of the early Darling settlers was visiting Mr. Severns they discovered a nest of them and killed a large number. Some of the living descendants of this early settler in addition to those mentioned are: Floyd Severns and family, Mrs. Elizabeth Bucklew and family. Among those who came later to Jefferson Township and Warsaw were: W. D. Kissner, George Wilson, James Almack, B. F. Altman, S. H. Ayers, Samuel Beck, James Beck, John Speckman, Holder Blackman, Harrison Brillhart, William Croul, Casimer Fortinbacher, Cornelius Foster, James Cochran, Simon Elliott, Christian Kaser, C. Kaser, John C. Kaser, James Sharpless, James Wilson. Some of the secondary residents who were in business in Warsaw were: Isaac and Moses Schaffner, merchants, in a building which stood where Young�s restaurant now stands. (They were ancestors of the Schaffner part of the Hart-Schaffner-Marx clothiers.) Drs. Stanton, Blackmann, and Lawson; Chris. Strome, a merchant in a building that stood on the present remises of James Frederick. (It is said anything from a pin to a pulpit could be bought from Mr. Strome.) Mr. Lenhart, cooper; Mr. Tearily, cabinet and casket maker, in a building across the street from Urey�s garage; James Foster, merchant, in the present home of Mrs. Endsley; Darius Wright, blacksmithing, at the present shop; Nathan Bucklew, justice of the peace; John Baumgardner and Samuel Beck, millers; James Beck, miller; C. Kaser and R. C. Frederick, harness maker; Tom Edwards, shoemaker; Mr. Ripple, tailor; Jacob Holbrook and Jacob Kline, wagonmakers; Adam and William Coffman, harness makers; Mr. Long, merchant; George Thompson, blacksmith, and E. Z. Hays, lawyer. In keeping with the centennial spirit, we have briefly treated early settlers of Jefferson Township who came here about a century or longer ago. 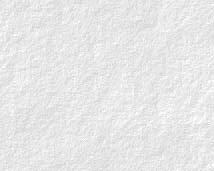 We hereby express our regrets for the incompleteness, omissions, mistakes, and alterations made; also, our thanks and appreciation to those who have received us so kindly, and by word, pen, or book have assisted in furnishing material for this paper.